We get many questions about Paypal. Our system is compatible with Paypal, meaning you can use it for a form of payment with ouronline booking system.The reason we use it, is to allow owners that have a Paypal account try our services out. That being said, we do not recommend it for most owners. Paypal was not designed to be used forvacation rentals.It was designed for EBAY and to sell $30 items online. When you try to run $500 to $3000 transaction thru Paypal you may run into road blocks. Right now I want to scream. I have been using Paypal for payments. I chose them partly because they were highly recommended here & partly because, as a long-time Ebay user, I had a good track record with them. Someone paid through Paypal and they are holding the funds pending an investigation. This has been going on now for 10 days. Evidently, the buyer (renter) had not used their account in three years & suddenly made a rather large purchase. I responded to the dispute & called in after several days. I was told the buyer needed to call in. I called the renter, she called in and called me back saying that the funds should be released within an hour. Several days later that has not happened. I called again, got someone who could barely understand me and vice-versa, got transferred to a fluent English speaker, but got nowhere. They don't seem to know anything about the conversation with the renter and have put me off until Friday -- but with no promise of a resolution. They say they have 30 days to complete the investigation. Meanwhile, my money is in limbo. Why does Paypal stop transactions? Paypal is in between you and the guest. They are watching trends and dollar amounts going back and forth. If they see a high dollar amount, they may stop the transaction and want to investigate it. This holds up the money and may either delay it or send it back to the guest. This can cause a huge problem for an owner as well as the guest. Calling Paypal is not a simple task. They outsource the calls and getting someone that speaks proper English may be a challenge. They may also impose limits that are hard to reason with. One owner may have a $1500 limit and the next owner may have a $2000 limit. So it you are over the limit, you have to break up the payments over time, this is another waste of time and possible way to lose a booking. Going back and forth with your guest, trying to explain why Paypal will not accept the transaction is not a way to impress your customers! Another common problem is the guest "thinks" they need a Paypal account to continue with the booking and they stop in the middle of the transaction. That is not good. So the question comes to mind, "Is the $15 a month for the merchant service worth it?" My answer is YES! The eCom merchant service allows you to operate as a business should and not have someone in between you and your guest stopping the transaction. The first time you lose a $2300 booking, the $15 a month fee to have a full merchant service for your vacation rental now seems like a bargain! The merchant service will also allow you to refund transactions if needed. Paypal presents another problem. To do a refund your guest has to have a Paypal account. Some guest have one, some don't. So that will take more time to figure out and then you may have to mail a check instead of an online transaction. So all this being said, we did design ivacationonline to work with Paypal so you could see how ouronline vacation rental softwareoperates before you apply for an eCom merchant account. 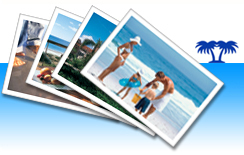 Once you see how it works, I would highly recommend getting the fullmerchant service for your vacation rentaland you will never regret it. Optimizing your rentals and cash flow is best done when you operate like a business. A real business needs a real merchant service. Don't try to be penny wise and pound foolish. The small monthly fee for a merchant service is well worth it. This will save you time, optimize your rents and keep business coming back. I would not be without it. Good luck with your rentals!